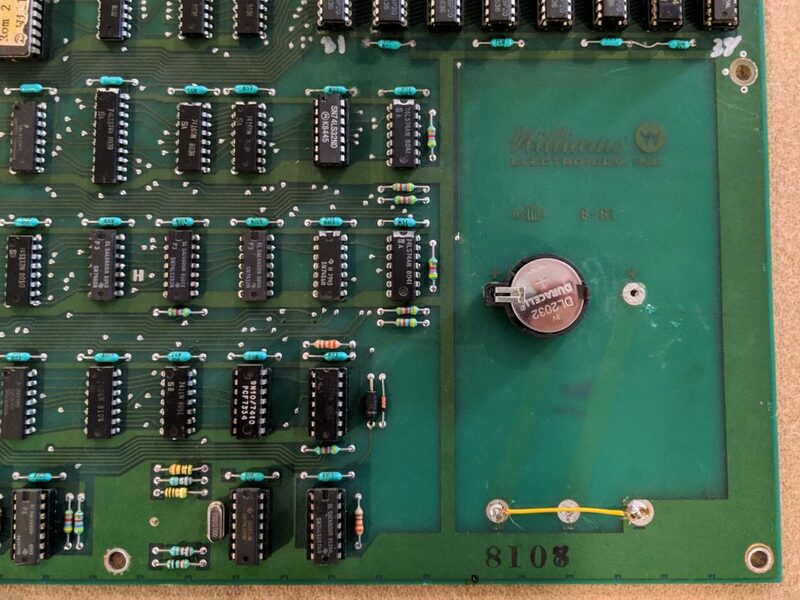 So, after determining that the power-up issue with the Defender system at Palm Springs Midmod was a minor issue with the back panel service power cut-off switch, restoring power revealed that the persistent memory of the unit was not working properly. This is almost invariably an issue with the battery that powers the persistent memory when AC power is shut from the system. I popped the back panel to get a good luck at the battery. As noted previously, both my Defender and Joust systems have been upgraded with a lithium battery update. Unfortunately, the placement of the game board on the side of the cabinet and the lower right side placement of the battery location makes it very difficult to access and remove the battery for testing so I was forced to unplug the board from the harness in 5 locations and then unscrew the 6 screws affixing it to the side of the cabinet. Once the board was off, I pulled the battery and tested it with the multi-meter. Sure enough, it was only reading .04V instead of 3V it should read. Off to the store to pick up a basic 2032 3V lithium coin battery. Only $2.99 at the Ace Hardward in South Palm Springs. 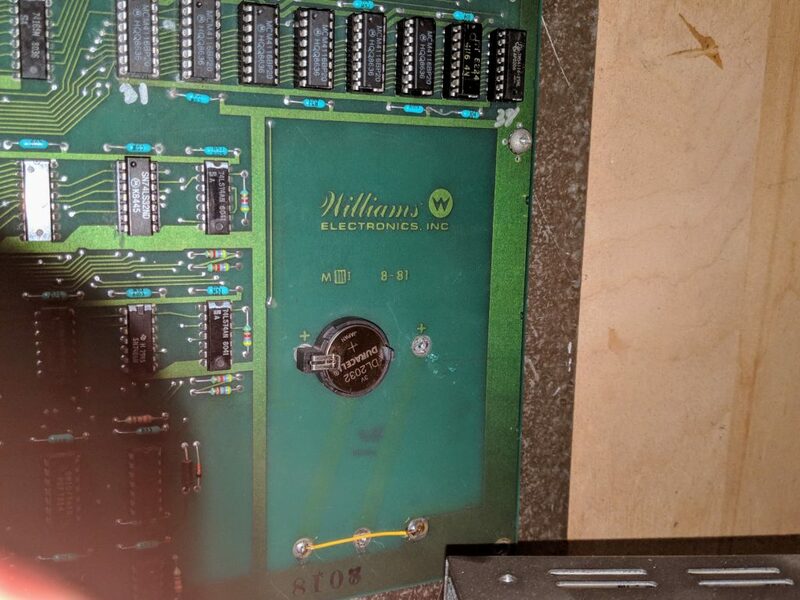 Once the battery was replaced and board re-affixed to the side of the cabinet and plugged back into the harness, the game fired up right away. With the persistent memory cleared, the configuration screen once again appeared upon post, but after configuring free play, powering the system down and back on brought it right up to the attract screen with free play enabled. Success! Well, at least 1 of the 3 systems was back up and running and it looks like Tempest is making a run for top “problem child” of the collection as Defender seems relatively compliant nowadays.